WeatherNet is a regional weather service sponsored by Southern Oregon Education Service District (SOESD) offering a wealth of information to educators, students, and the community. It is an Internet-based resource available to all where one can get up-to-date weather information for our regions, prepared lessons, and material about the weather, climate, geography and topography of Southern Oregon. As of this writing, the WeatherNet service is being updated with new equipment and procedures which will allow it to be used year-round. The site can be accessed directly at http://www.soesd.k12.or.us/weather. Or, one can access the site via the following route: the SOESD Homepage (http://www.soesd.k12.or.us/) > School Improvement Team > Curriculum and Assessment > Science > Weather. If you access current weather conditions, you will be taken directly to a graphic screen showing the last 24 hours of temperature, rainfall, wind speed, humidity and pressure in Medford (See Figure). There are five stations online: one in Medford (SOESD); two in Illinois Valley (Illinois Valley HS and Lorna Byrne MS in Cave Junction); and two in the Klamath Basin (Mazama HS in Klamath Falls and Henley HS in Klamath County). The lesson pages target 8th grade and CIM Benchmarks. Teachers can find lessons on rain shadow and the adiabatic rate using the WeatherNet data, different types of precipitation, snow fall patterns in Western Oregon, and web quests on global warming. A science inquiry lesson is also included. The WeatherNet site, however, is much more than just some weather data and lessons. 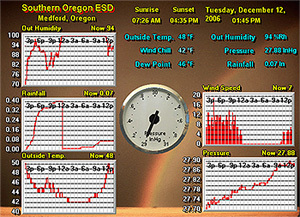 You will also find regional historic weather data provided by the Oregon Climate Service (http://www.ocs.oregonstate.edu/index.html), topographic information including cross sections of Southwestern Oregon, and precipitation maps of Western and Southwestern Oregon (courtesy of the University of Oregon and Allan Cartography). The information provided by WeatherNet is designed to serve our communities in three ways. First, it provides real-time data for students and teachers coupled with prepared lessons. It also provides data and information that can be directly incorporated by teachers into their existing curriculum as well as images that can be easily copied and inserted into worksheets and PowerPoint presentations. WeatherNet is also a community service providing information to the general public and media. Educational uses are not limited to weather science. In the past, chemistry teachers have used the data to access barometric pressure for their labs, and used the data to teach the concept of double “y” axis graphing. Business teachers have used the data in teaching data bases and spreadsheets. Math teachers can use the data for teaching graphing and predicting, while social studies teachers can use the data in teaching about the variations in our regions and their implications. The weather is something we all live with on a daily basis. It is something students can relate to and because of that it can provide an excellent platform for teaching and learning. It is a goal of the SOESD to support such teaching and learning with the WeatherNet site. For more information contact Thomas Glover, Science Specialist, SOESD 776-6771.